Once you have done this, your channel is ready to use. At https://tlsn.com/channel/username you will find your channel "stream". This is where your recent activity will appear, in reverse chronological order. If you post in the box marked "share", the entry will appear at the top of your stream. You will also find links to all the other communication areas for this channel here. The "hamburger" menu in most themes will provide you with navigation to other system components and apps. The Photos page contain photo albums, and the Events page contains events share by both yourself and your contacts. 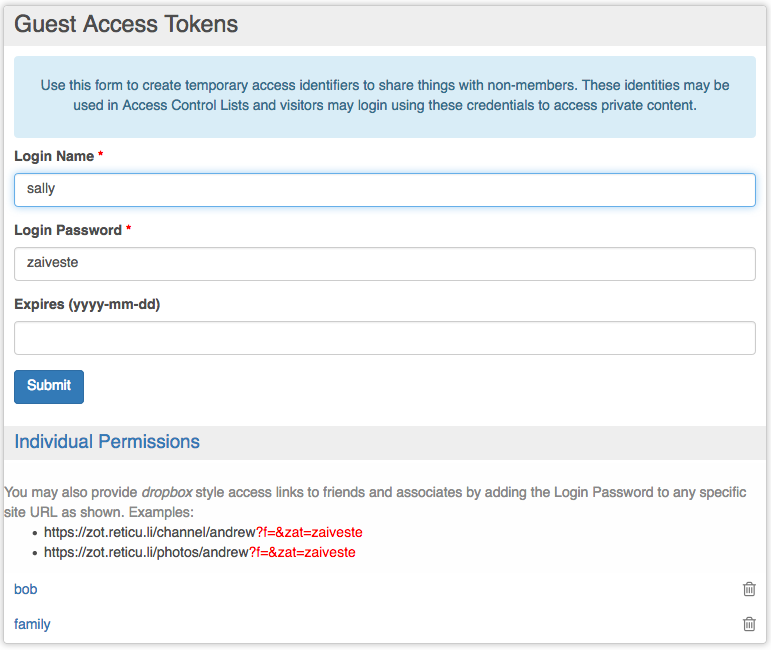 To delete attachments or change the permissions on the stored files, visit https://tlsn.com/cloud/username replacing username with the nickname you provided during channel creation. Your files are visible on the web at the location https://tlsn.com/cloud/username to anybody who is allowed to view them. If the viewer has sufficient privileges, they may also have the ability to create new files and folders/directories. This should only be used for smaller files and photos (up to a few megabytes) as it uses internal memory. For larger files (videos, music, etc. ), please upload using WebDAV. These files may still be retrieved via web access. When using WebDAV, the file is created with your channel's default file permissions and this cannot be changed from within the operating system. It also may not be as restrictive as you would like. What we've found is that the preferred method of making files private is to first create folders or directories; then visit https://tlsn.com/cloud/username select the directory and change the permissions. Do this before you put anything into the directory. The directory permissions take precedence so you can then put files or other folders into that container and they will be protected from unwanted viewers by the directory permissions. It is common for folks to create a "personal" or "private" folder which is restricted to themselves. You can use this as a personal cloud to store anything from anywhere on the web or any computer and it is protected from others. You might also create folders for "family" and "friends" with permission granted to appropriate privacy groups. 4. Type 'https://tlsn.com/dav/nickname' in the textbox (replace nickname with your channel nickname) and click the Complete button. Where https://tlsn.com is the URL of your hub, /mount/point is the location you want to mount the cloud, and <DesktopUser> is the user you log in to one your computer. Note that if you are mounting as a normal user (not root) the mount point must be in your home directory.